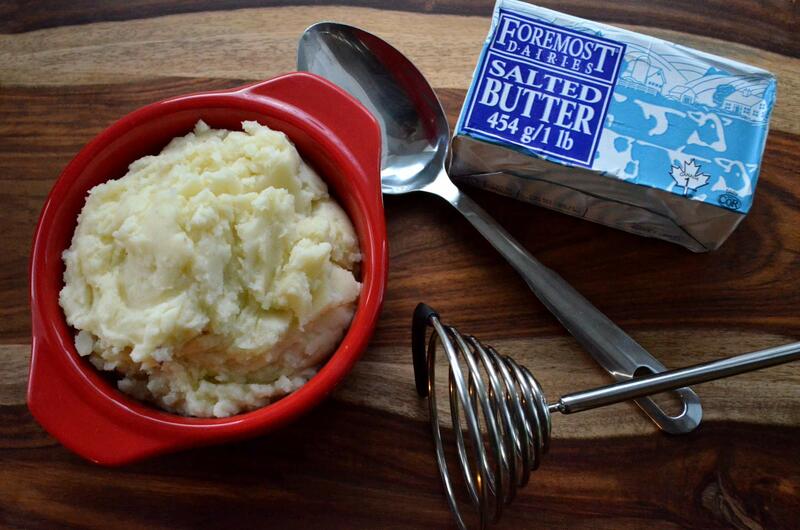 Seriously, try to not stuff your face with these mashed potatoes – I dare you. Mashed potatoes are my favourite food ever. Yes, you read correctly, I said ever. Consequently, I have searched for the best way to make the most delicious mashed potatoes. The secret ingredient? Butter – plain and simple. A few other techniques take this recipe to the next level. Firstly, by not peeling the potatoes before boiling them, you prevent them from getting water-logged. Secondly, by adding the butter before the milk, the fats in the butter will stick to the starch. This will prevent the potatoes from getting water-logged by the milk. The result will leave you with the creamiest of mashed potatoes. Place potatoes in a large saucepan and cover with water. Bring to a boil over medium high heat. Simmer until potatoes are fully cooked, approximately 45 mins. Drain water and let cool until potatoes are cool enough to touch. Once cool, peel skins (leave skin on if you prefer skins in your mashed potatoes). Dice potatoes into manageable chunks and return to the saucepan. Add butter and mash potatoes until smooth. For extra smooth potatoes, beat with egg beaters. Mash in milk and season with salt and pepper.